With Newsletter2Go’s newsletter software you can sign emails using an SPF record, Sender ID or the DKIM feature. This enables you to send authenticated newsletters, because it proves the authenticity of the sender (i.e. you!). It will increase the likelihood that your emails will be delivered, because it decreases the likelihood that spam filters will catch the newsletter. Email providers’ servers know when emails come from an authenticated domain. This means that your emails can be clearly assigned to you as sender. Email validation makes it impossible for unauthorized third parties to send communications in your name. If email validation is important to you, check out this blog post to improve your delivery rates. DKIM basically means DomainKeys Identified Mail. It was jointly developed by Cisco and Yahoo as an identification protocol for email senders. DKIM is used as an authentication method among other criteria by, for example, Yahoo and Gmail. Any mail from these email providers should carry a DKIM signature. If you use DKIM for authenticated newsletter dispatch, a DNS record will be added to your domain. The verification process will be carried out using the signer’s public key (which is to be found in the DNS). This digital signature helps prevent users from getting unsolicited emails, e.g. spam or phishing attempts. In return, senders who go through the email authentication process are rewarded with higher delivery rates. SPF stands for “Sender Policy Framework”. This email verification system is intended to prevent the email address counterfeit and misuse. Once an SPF record is added to your domain, it will show which computers are authorized to send emails from your email address. This authorizes Newsletter2Go servers and allows to send emails from this domain. If the Newsletter2Go delivery servers are registered with SPF, you will enjoy higher delivery rates. SPF is supported by many email providers such as Gmail or Yahoo. The sender ID is an anti-spoofing proposal, based on SPF. In contrast to the SPF, sender ID also checks the sender’s address in the email header whether it differs from the address that is visible. Therefore, a sender ID record can further improve your delivery rates. 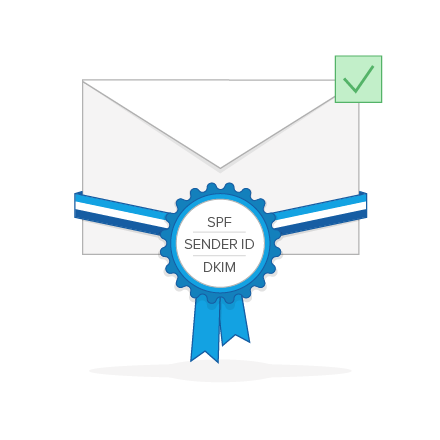 DMARC is an email validation system built on Sender Policy Framework and DomainKeys Identified Mail and it’s considered to be a more reliable solution than these mechanisms. This authentication protocol has been constantly gaining in importance and can significantly improve delivery rates. In contrast to standard verification systems, the subscriber’s reaction will be retransfered in case the authentification fails. The DMARC method is already used by Gmail, Microsoft and Yahoo. Take advantage of DMARC to send authenticated newsletters using dedicated IPs with Newsletter2Go.